Here is what I'm bringing White Chili. I wanted to bring back an old recipe from last year and re-post it for the football season. I should of posted this yesterday like Martha did hers, she is so smart (that's why she's the leader :D). It makes sense not to have it in the same post as Tailgating Time, maybe next week or not. I usually use white beans in the white chili, but I can't believe this...I didn't have any in the pantry. So I used pinto beans...they are one of my favorite beans, I like the nutty flavor it brings to the dish! 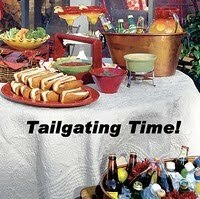 I think it's fine to post your recipe right on the Tailgating Time post and it sure looks delicious! Be sure to link it up even though it's on your post so it will be on all our blogs. Nice post, Lyndz! If not mistaken, you made this quite a long time ago.... last year! And it sounds as awesome. I love it too. Thanks for sharing & enjoy your day. Btw, I'm in the tailgating Time too! hehe... Have fun. I love that it's chili time again! The cooler weather (here anyway, lol) is such a relief and it's time for some cozy soups and comforting chili. This sounds great, different than the usual standard chili but just as yummy! I'm bringing along some delicious Italian sandwiches for the football game. :o) Have a great day! Thanks Martha! I have been trying to win so many of the CSN giveaways so I can finally replace my broken rice cooker! Yay! Kristy thanks for joining us again this week! I always love your recipes. Crispy lemon fried chicken sounds perfect for tailgating. Yes, I mentioned that I brought this one back from about a year ago when I was starting out and you and a couple others were my readers. Haha! Kristy you can make this with ground chicken instead of the pork! Cheers! Thanks for bringing something to the Tailgate party Brenda! It's not really cooler here, but if we waited for that we might not get a chance to make these warming dishes. My daughter really likes the white chili, and requests it often. I love those sandwiches you brought! I've never been fond of white chili (just like my color too much I guess :P), but think I'll try this with the red beans! Looks awesome. P.S. Congrats on the CSN win! Thanks Tamy ~ I guess mine isn't all that white, just it doesn't use red sauce or red meat. It does have green chilies and celery, I like the red beans better in it for flavor too. You can always toss some diced tomatoes on top or cilantro for color! looks delicious, even i like anything with pinto beans..Congrats on ur wining!! Perfect comfort food for chilly nights..it looks terrific! Sounds so delicious and flavorful with all that ingredients in it. Such a delicious food for the party Lyndsey ! I love white chili! So delicious, hearty and comforting for this time of year!